Aleshia McLaverty, leaves Antrim Court after pleading guilty to dog cruelty by leaving a dog at a house in Antrim. The dog was found dead later tangled in blind cords and suffered from dehydration.PICTURE MARK JAMIESON. Antrim and Newtownabbey Borough Council has issued a warning to pet owners that it will take enforcement action against anyone who fails to take appropriate care of animals. The warning comes after 23-year-old Aleisha McLaverty, a former resident of Firmount Drive in Antrim, was given a suspended prison sentence after pleading guilty to causing unnecessary suffering and failing to ensure the welfare of a Labrador pup for which she was responsible. The charges were brought against Miss McLaverty by Antrim and Newtownabbey Borough Council under the Welfare of Animals Act (NI) 2011. The charges related to findings following an investigation by Animal Welfare Officers regarding offences in April 2014, which related to a dog that had died of dehydration and starvation whilst in Miss McLaverty’s care. At Antrim Magistrates Court on August 4, Miss McLaverty’s was given a two month custodial sentence, suspended for two years. 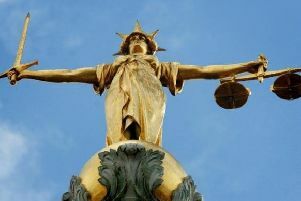 In addition she was disqualified from keeping animals for a period of five years and ordered to pay legal costs of £119. Clifford Todd, Head of Environmental Health for Antrim and Newtownabbey Borough Council said: “Council gives a high priority to the welfare of domestic pets and horses and operates a rigorous enforcement policy to ensure full compliance of regulatory requirements. “Complaints are investigated thoroughly and where necessary formal action is taken, which may include the service of Improvement Notices or, in extreme cases, the seizure of animals.